For the last couple of years my wife and I have introduced a tradition of making our gifts for each other. On the one hand it can be very hard to think of something worth making that the other will want, but obviously it is a much more personal gift and I enjoy the challenge of figuring out what I can make that will 'fit' into my wife's life as a useful addition. Rather than be just something that she uses once and puts away. This year that gift was what I am calling a 'lap desk' but I guess it just a freestanding mini desk that has a tilting top. My wife often sits on the floor when she is working on projects, or writing in her notebooks, painting/drawing etc. But that tends to mean that she hunches over to use the floor and its not great for her back. So I came up with the idea of making her something that was low enough to work comfortably on whilst sitting on the floor, that she could drag into position, and set the angle that most suits whatever she is working on. It's not super portable, however it is reasonably easy to move around, and hopefully wherever she wants to have a surface to work on at a comfortable angle she should be able to use this little desk. It is made from american white oak. This is a material used in basically all of my 'furniture' creations, the simple reason being that Jewson's is my nearby supplier, I can drive there and collect what I want, and they basically have american white oak or meranti as hardwood options. When I built my first floor standing mirror I chose american white oak. From then on I've basically been keeping up with the theme. At this point I have 2 hallway mirrors, the floor standing mirror, a table for the end of the sofa, and now this desk. It is nice to have the consistency, and it also means I become relatively familiar with working on this wood. What finishes work, how the grain reacts, how well it works with a burning tool (not well, oak is actually hard to burn). I started out, as I often do, sketching ideas in my maker notebook. I knew that I wanted it tilting at the top, and obviously someone needs to be able to have their legs underneath it, so those factors dictated a certain amount of the design. Originally I had intended to pivot the top on some how turned wooden pegs that would fix into either side of the frame and be inserted 'loose' into receiving holes in the top section. However as I got the material and glued up the top and started to feel the weight involved I decided that it was way too risky to try this. Firstly the two pegs would need to be very precisely aligned, and they would be bearing the whole weight of the top on two wooden joints. For the lid of a box that might have been ok. but my wife needs to be able to lean on this whilst she is working, so I decided to just use a pair of metal door hinges mounted on the front cross beam. I retained the idea of having the top cross bars protrude (that was originally their for the wooden dowels to go into) this means that the hinges are tucked underneath out of view, and the protruding ends mean nothing catches on the swinging front section of the desk. Originally I also drew it as just 4 legs like a coffee table, but I realised that the natural thing with a desk like this is to push and pull it by the legs to slide it over your lap. I was worried that this would cause the legs to splay and straing against their joints at the top, so instead I added a bottom cross beam, so the whole things really slides on two runners. This makes each end much more rigid and hopefully makes sure that it will stay secure for many years of sliding around. The one element of design that remained undecided the longest was (foolishly?) the actual mechanism to support the desk at the various working angles. I had the whole thing basically built and hinged before I settled on what I would do to support it. I had a bunch of different options, I have previously made a tilting document stand which has a single central pivoting 'leg' with a wide cross bar at the bottom that dropped into one of a set of slots on each side. That was fine for a narrow stand, but for something of this width I didn't think it would work well. Another option was to put a central crossbeam in and have that with notches and have a similar centrally pivoting arm that notched in at different positions. However I really wanted the support to come at each edge rather than just the middle. I toyed with the idea of having 3 or 4 pairs of pivoting arms of differing lengths, such that you could just swing out the length you wanted and they would rest against the back cross beam. I even sketched a version where these pairs swung up from the cross beam to rest on the back of the pivoting desk top. requing each pair to swing out at a different angle to meet the top at its various positions. 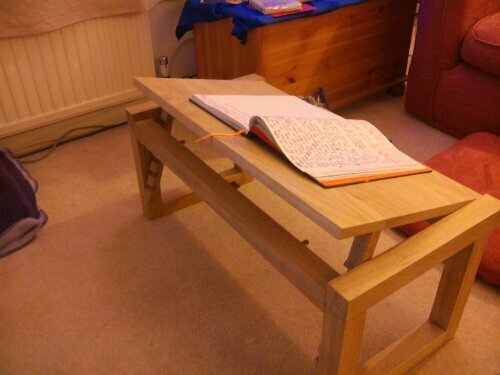 Ultimately I decided hinge a length of wood at each edge of the desk. Each of the lengths of wood would have a series of notches cut in, and a dowel protruding from the crossbeams would be where they rested. The hinges would allow the length of wood to hit at slightly different angles for each notch. As indicated in the design section, it was in construction that some things changed, including the 'final' design for how the tilt would work. (more on that later) I decided to make the joints as pretty chunky mortice and tenon type. With the main front and back cross beams with tenons into mortices on the legs. Where I had side cross beams across the top of the legs I actually ended up cutting the tenon so that it was half in the leg and half in the side beam. so that the front and back beams would sit lower than the side height, enough that when the desk top was on top of those supports, it would rest flat with the sides. For further support of the top cross beams I drilled holes for a dowel connection just behind the mortice hole. This means the sides that joined the front/back leg dropped down onto the dowels, and in doing so formed the full mortice hole that the front/back beams tenon'd into. 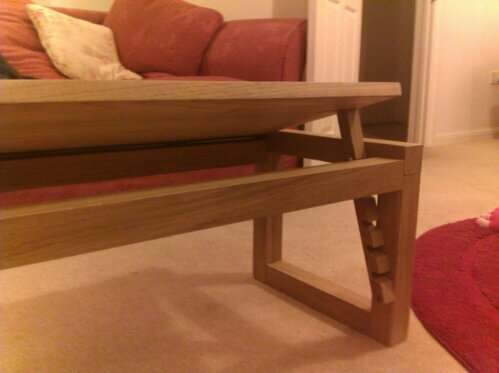 The beam that joined the front/back leg at the bottom was a straight forward mortice/tenon. Though I ended up doing the tenon the full heigh of the wood. This means that along the bottom you can see the joint. In retrospect I wish I'd made the tenon joint shorted so that the bottom would be 'cleaner' but it doesn't really matter, no one is going to be looking at the bottom. The top is glued together from 4 lengths of a plank. This was basically dictated by what Jewson had available. I knew the dimensions I wanted to achieve, and I would rather have had fewer joins. However the wider board lengths would have required me to buy a lot of extra to make what I needed. So I wound up with slightly narrower board and more joins. This just meant more glueing, and a lot more sanding to try to get the top surface as flat as possible. It was doing this that made me realise I should really get myself a hand held belt sander if I want to do this kind of thing more often. Lastly the pivot mechanism... I made up the wooden pieces complete with notches, and set the turned oak pegs into the side beams for them to notch into. And I was positioning everything to work out where I would want to screw the hinges...When I realised that then hinges were not required. the wooden lengths just naturally rotate around to present a flat to the underside of the desk for support. It's not quite perfect, as the last couple of notch positions cause the end of the piece to hit the back cross beam, so it doesn't quite contact the underside of the desk flat. But it is enough to provide support and it is only the steepest angles that have that issue. This simplified things since attaching the hinges provided the risk of not mounting them quite evenly etc. It also saved me the time of doing that. So I could move on to finishing the piece. To finish I sanded everything down to 320, then applied some clear matt varnish. I then cut back the first coat with 400 grit, then applied another coat. What I like about the finish is it still feels pretty natural. but does a nice job of protecting the desk and should stand up to heavy use. Here are a bunch of pictures of the finished item from various angles. Usually I take pictures of a project throughout, but since this was a gift, and a surprise, I didn't want to take a bunch of pictures whilst i was making it.